When analyzing data or trying to understand an algebraic equation, a quick X, Y plot is often an invaluable first step. The O.S.I. C1P, despite its extensive graphics character set, doesn't particularly lend itself to graphing because of its cramped 24 × 24 video format. One way to ease the crowding and double the resolution of a plot is to make use of graphics symbols that divide each square into quarters. I've written a program in BASIC that does this quickly and neatly (Fig. 1). As written it can stand by itself or, with slight modifications, function as a subroutine called up by a number-crunching main program. The effective display is increased to 40 × 40 bringing it into the range of usefulness for many scientific and business applications. Line 5800 computes the video display locations rounded to the nearest integer. The axes are drawn by lines 5210 - 5252. I also include a background grid (lines 5100 - 5130) to help read the plotted curve, but this may be deleted easily if not needed. The purpose of lines 6000 - 6030 is to check for a "return" that when found causes a recycling to the start. None of this would be any good without a curve to plot. Line 210 is where the user enters his equation (or READ statement for data input) before running the program. DA(I), the data array, remains unaltered in case it is needed elsewhere. Any number of variables supplied by the user and/or program may be used so long as they are assigned before line 210. Figure 3 shows a graph of DA(I) = SIN(I/X)-COS(I/Y) where X = 3, Y = 6.3, and I goes from 1 to 40. 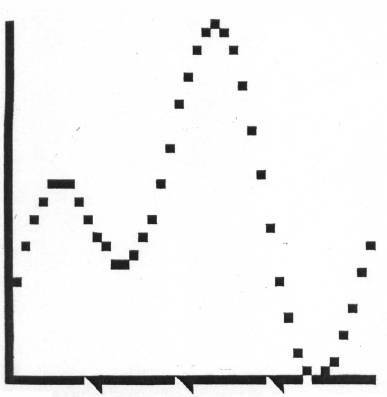 Note that the scaled value of the 34th point is zero and that a blank spot is placed on the X-axis under the previous point. The program occupies about 1700 bytes of RAM, but by dropping all the extras — remarks, header, instructions, etc. — it can fit into about 1 K of memory. Running time is around 8 seconds, much of it spent scaling and drawing the background; the curve plots out rapidly. In conclusion, this routine takes a big step toward relieving the C1P's small display problems when graphing. It is compact and quick, leaving plenty of memory to use for other things. Fig. 2. 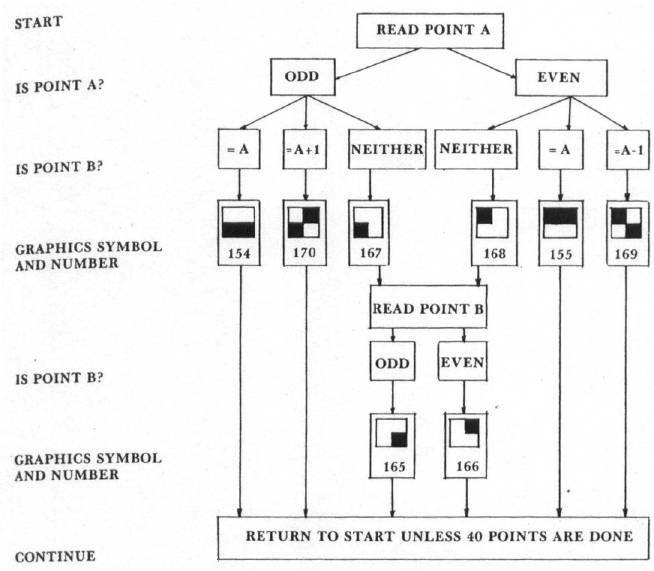 Decision tree for selecting correct graphics symbols. Figure 3. Double-density Plot On The O.S.I. C1P. 72 PRINT "ON THE O.S.I. CHALLENGER"